The Prime Minister, Shri Narendra Modi lays foundation stone of AIIMS Bilaspur, Himachal Pradesh on October 03, 2017. 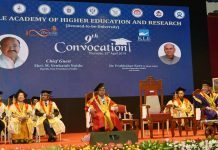 The Governor of Himachal Pradesh, Shri Acharya Devvrat, the Union Minister for Health & Family Welfare, Shri J.P. Nadda, the Chief Minister of Himachal Pradesh, Shri Virbhadra Singh and other dignitaries are also seen. Bilaspur : The Prime Minister, Shri Narendra Modi, visited Bilaspur in Himachal Pradesh today. 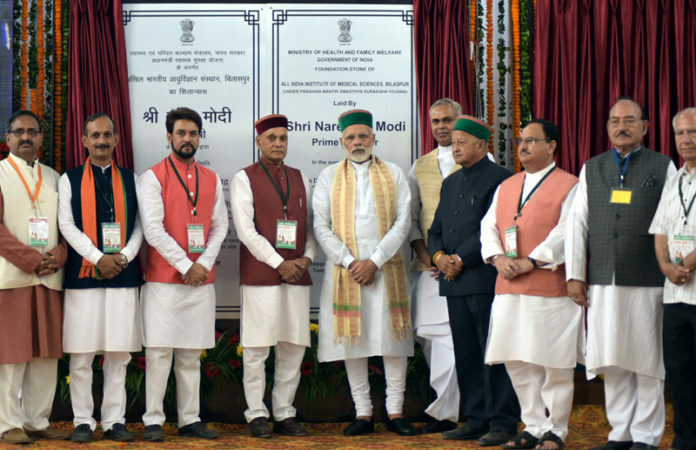 The Prime Minister laid the foundation stone for the All India Institute of Medical Sciences (AIIMS), at Bilaspur. This 750 bed hospital will be built at a cost of approximately Rs. 1350 crore. In addition to healthcare, it will also provide medical education at the under-graduate and post-graduate level, besides nursing. The Prime Minister also unveiled a plaque to mark the launch of Digital Nerve Centres for primary healthcare.